Variety. 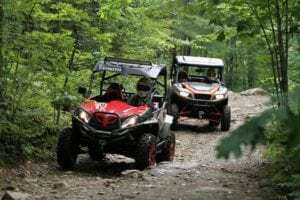 Apparently it’s the spice of life according to some old cliché, but it’s also the perfect word to describe the trail offerings found along the Haliburton ATV Association’s (HATVA) trail network that takes you through the picturesque landscape of the Haliburton Highlands. The HATVA is comprised of over 1700km of well signed, maintained trail, with the vast majority of it found within the Haliburton Highlands region. 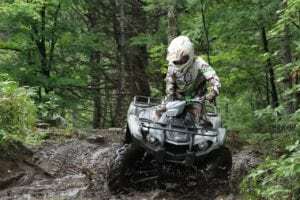 As legislation welcoming ATV/UTV enthusiasts continues to improve in the province of Ontario, we decided to sit down with members of the HATVA to plan a multi-day exploration of their trails, to showcase what the region had to offer. One of the first things we learned when sitting down with current HATVA President Barry Lord and former President Bob Johnson, is that this club understands the importance of communicating trail difficulty. Their full color map book clearly indicates the difficulty level of trails and is incredibly easy to navigate. Orange trails are for Beginners, Blue for Intermediates, and Red for Advanced riders; it really doesn’t get much easier than that. On our last multi-day ATV trip where we wandered the EOTA, we backpacked from one destination to the next on a multi-day loop. (Check out our back issues on atvworldmag.com if you missed it) After Bob and Barry shared some of their favorite riding spots in the region with us, we decided to create three separate day-rides utilizing the same basecamp. We also noticed the balanced variety of trails catering to different skill sets, and because of this, we thought it would interesting for each day of riding to focus on trails of a certain difficulty level. With the big picture ironed out for our tour, the next step was to figure out a destination to call home while in the region. Luckily, Bob and Barry made that decision relatively easy for us. Given the day trips we had planned, they suggested we head over to what the locals call Ray’s place, or what is actually known as the South Wind Motel & Campground. Now we know the word “motel” doesn’t seem appealing to some riders, but make no mistake, this is more than likely the most “off-road vehicle” friendly accommodation destination we’ve ever come across. The facility is located on 131 acres of woods, ponds, trails and rock, and the terrain on the property hasn’t gone to waste. When Ray took over the business, he had 14km of bi-directional trails, professionally designed on the property. You can easily spend multiple days wandering the Haliburton Highlands, make no mistake about it. But, if you get back to the South Wind and still haven’t had enough riding for one day, you can fill the remaining hours of daylight by testing the limits of your skillset and machine, without even having to leave the property. 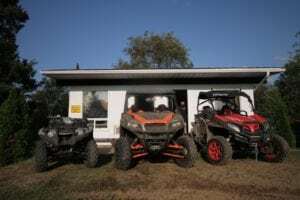 With a place to call home for three days, our day trips planned out, and the dates locked in, we loaded up three units from the ATV World HQ and headed up on an early Tuesday morning to get the day started. The first unit we had with us was a 2017 Polaris General 1000 2-seater. Our editor, Nick Nelson, recently just documented his thoughts on his first 500km in the 4-seater General, and based on his feedback, we thought the 2-seater version would be a worthy buggy for this trip. The second unit in the trailer was the all-new, freshly revived 2018 Yamaha Kodiak 450. 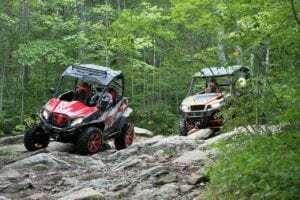 We thought it would be worthwhile to communicate that a wide variety of buggies could traverse the Canadian Shield in the Haliburton Highlands, and have fun doing so. You can’t really be on further ends of the spectrum than the General and the Kodiak. At the end of the day, we still needed one more unit, and based on the fact that we were planning on sampling some advanced level trails, we wanted something with a winch. Logically, we picked up the phone and reached out to our friends at CF Moto, and we were able to pickup a fully loaded Z Force 800 en-route to South Wind. 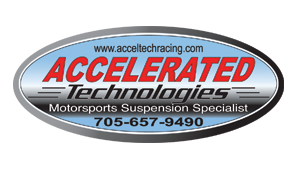 A huge thank you goes out to Derek Greer at Balsam RPM for helping us out with a unit for the week. As we arrived in the region, we were reminded of one thing every powersports enthusiast knows all too well; you can’t control Mother Nature. This summer, the Northeast has seen much more precipitation than usual. This is great for keeping the dust down, as you’d normally be jockeying for the lead position on the trails to avoid the constant dust cloud that seems to get through all layers of gear, regardless of brand. This summer however, we were treated to a tacky and loamy base that provided optimal traction and minimal dust inhalation. Now the downside to a “wetter than usual” summer is that we were more than likely going to be riding in the rain for at least one of our days on the trail. As we turned off of Highway 35 and onto County Road 121, that’s exactly what happened. Mere minutes from our launch point to begin our first day of riding, Mother Nature unleashed what would be a total of about 15mm of rainfall. Regardless of the precipitation, there was no lightning in the area at the time, so we did what any ATV enthusiast would do, we unloaded the buggies, put on our rain suits and hit the trails. Queue day 1. Originally, we had planned to start with the beginner trails on Day 1, and gradually increase the difficulty level throughout our stay in the region. With the rain falling steadily and increasing the difficulty associated with navigating the Canadian Shield, we shifted our attention to the expert level trails in the area. We had originally planned to do the infamous Miserable Lake Loop, deemed one of the most grueling and technical loops in the region. Unfortunately, the threat of lightning later in the afternoon made us think twice. The last thing you want to do is be halfway through a full day ride, and have to deal with lightning. Ray insisted his trails would offer the same degree of difficulty found on the loop, but with the convenience of us being able to abort our riding excursion at a moments notice. As it turns out, the trails on the South Wind property are actually sanctioned as part of the HATVA. With the buggies unloaded and our rain gear on, we headed for the trails at the back end of the property. One thing that became apparent very early on was that the Canadian Shield was going to put our machines and abilities to the test. Rock crawling would become a very common theme throughout the afternoon. As the rain continued to fall, we were left climbing incredibly steep and increasingly slippery inclines. The first buggy to head down a trail would have the disadvantage of having to determine the path of least resistance. However, they would leave behind them a trail of mud stuck to the rocky landscape that our second and third riders would have to navigate. If you’ve never encountered this sort of terrain before, beware of the ice-like conditions that mud water and rock create. On more than one occasion, we had vehicles slipping sideways down an off-camber section of rocky trail. One strategy you will definitely need to adopt in trails of this caliber is scouting and guiding. For the sake of your skid plate, it’s worth the extra time to scope out the trail ahead on foot and discuss the plan of attack. We began heading down one of the extreme trails on the property like Razor and Silver. We regularly were off our machines and guiding each other over obstacles to make sure we weren’t going to get hung up or leave traces of undercarriage behind. As we approached the end of the first section of Silver, another important tool came into play. In this region, if you’re looking to go on anything besides a beginner trail, we’d definitely recommend having a winch, and not travelling with less than two machines. Proper winching technique and safety is a must. Take our Polaris General for example, where the dry weight of our model is 1544 lbs. ; you need to make sure that you are winching to something that is going to be able to stand up to that kind of weight. This is where having a second machine out with you comes into play, because sometimes the best thing to winch to is another buggy. You’ll also need to be wary of where the machine being winched could end up, should things go wrong. A few hours into our technical afternoon, the lightning that was threatening began to light up the gloomy sky, and we quickly headed back to our cabins. Although in the short time it took us to get from the trail system to the cabins, we ended up soaked as the rainfall intensified. We were still smiling from ear to ear at the endless challenging terrain this region could clearly offer. With no end in sight for the lightning and rainfall, we decided to call it a day, park the buggies and call the Minden Taxi service. If you’re in the region and you have a taste for wheat and barley based beverages, make sure you head over to the Boshkung Social. They typically host local food vendors on site, and serve their exceptionally smooth variety of brews, crafted just up Highway 35 at their headquarters in Carnarvon. Fortunately for us, on the night we arrived we were just in time to get involved in Radio Bingo by local radio station Canoe FM. Although we weren’t lucky enough to pocket the $500 grand prize, we did pass enough time for the storm to clear, get back to South Wind, and regroup for day 2 with clear skies in the forecast. As dawn broke on Day 2 of our journey, we all agreed to get an early start and try to complete the longest day we had planned, the Outhouse Trail. Geared up and ready for a day on the trails, we did what any Canadian would do and headed straight for a Tim Horton’s coffee. Moments like these are when you really appreciate the fact that the region has embraced ORVs on public roads. Although you can’t ride along Highway’s 35 and 118, you are able to cross them when needed. Thanks to this, we were able to ride right up to the Tim Horton’s parking lot from South Wind Motel and coordinate our game plan for the day. Sticking with our authentically Canadian experience, we decided to gather the necessary supplies to enjoy the true Canadian wilderness with a trailside lunch at our scenic lookout destination. When examining the HATVA map, we confirmed there were designated lunch spots of particular interest on the Outhouse Trail. After a quick stop by Home Hardware to grab a portable campfire griller, followed by a pit stop to grab some ingredients for our feast, we headed through Minden and swung a left down Scotch Line Road towards the Outhouse Trail. With no rain in the forecast for the remainder of our stay, we reached the end of the roadway and came across a staging lot for riders to launch from. 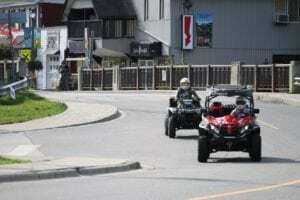 These staging lots appear quite frequently throughout the Haliburton Highlands, and allow riders who want to avoid taking their buggies down roadways, a place to safely park their truck and trailer. Being on the blue “Intermediate” trails, we quickly noticed that we were able to move along at a much quicker pace than the day before. It was still very evident that the Canadian Shield comprised the heart of this region. However, the helmet-sized boulders we had to navigate the day before, were fewer and farther between. Within a few minutes of being on the trail, we came across the deepest water crossing of our entire three-day ride. It’s definitely worth paying attention to recent rainfall accumulation in the region when planning a ride here, after the substantial amount of rain the day before, we were clearly dealing with a water crossing much deeper than normal. Although we did need to stop and remove the floorboard drain plugs after safely reaching the other side, we didn’t find the crossing particularly difficult. The reason for this again relates back to the Canadian Shield. The base of the majority of the water crossings we crossed throughout our travels all had a hard bottom. While the crossings were indeed deep and required some patience, our machines stayed relatively clean throughout the day. As we continued down the trail with a steady mix of water crossing, rock crawling, and dirt trail runs, we became increasingly aware of the staggering amount of option trails in the area. It wasn’t uncommon to be riding along and have three separate routes of varying difficulty, all taking you to the same ending point. This plays back into the overall theme of the region, and what Barry and Bob really wanted us to communicate when coming to the region, there really are trails here for people of all comfort levels. We will be the first to admit, when heading to a scenic lunch destination, the term “Outhouse Trail” is not a very appealing name. However, it became painfully obvious where the name came from as we reached our destination. Yes, you guessed it; we came across a bright green outhouse to let us know we reached our lunch spot. A quick left down a tight section of trail, and we arrived atop a rock face overlooking a large hydro cut valley. Although the hydro towers still cross the skyline in front of you, the vast amount of greenery that you overlook from this spot made it worth the break for lunch. At this point, we came across a conveniently placed fire pit, and got to work getting a campfire going to make our roast chicken sandwiches. Its important to note, if you plan on having a trail side cookout in Haliburton Highlands, or any region for that matter, ensure there are no fire bans in effect during your stay. Also, please don’t forget to ensure any fire is fully extinguished before hitting the trails again. After taking some time to enjoy the scenery and our trailside snack, we hit the trail back to Minden once again, the same way we came. On our way through town, we pulled over to the Dominion Hotel & Pub, right along the Gull River to grab dinner. Shortly after, we headed back to the South Wind Motel & Campground to rest and recuperate for our final day of riding. As the sun rose on Day 3, we were excited to head up to the Village of Haliburton and showcase the beginner friendly trails in the area. We decided to take the intermediate trail from South Wind over to the intersection of the Rail Trail before heading North to Haliburton. Unfortunately, although UTVs are legally operable on designated roadways and HATVA trails, the Rail Trail itself is only accessible to ATVs, as it’s a multi-use trail and is shared with walkers, hikers, etc. Luckily, Gelert Rd. can be used as a bypass, so our lonely Yamaha Kodiak proceeded down the rail trail, while our two UTVs ran parallel along the roadway. The Rail Trail is definitely the perfect trail for any beginner rider who has enough experience to safely ride on level terrain, but doesn’t feel comfortable on uneven or challenging landscapes. The trail is extremely well signed with stop approaching signs, stop signs and even interstate style highway markers every kilometer, indicating your exact distance from Haliburton. At the end of the Rail Trail, our convoy was reunited and we followed County Road 21 to the ORV parking lot at the edge of Haliburton Village. Unlike Minden, you’ll have to park your buggy at the edge of the village and proceed on foot. Luckily, directly across the street from the lot is the Baked & Battered Cottage Bakery & Fish Fry. After polishing off what can only be described as some of the best fish and chips around, we headed back once again down the way we came in the morning, to load up our truck and trailer and head back to the ATV World HQ in time for dinner. As we loaded up our trailer, one of our riders put it best by saying, “I feel as though we’ve been here for three days of endless riding, but when I look at the map, it’s as if we’ve barely scratched the surface of what this region has to offer.” We spent three days exploring the authentically Canadian landscape offered in the Haliburton Highlands, and there’s one thing we know for sure – we’ll be back! 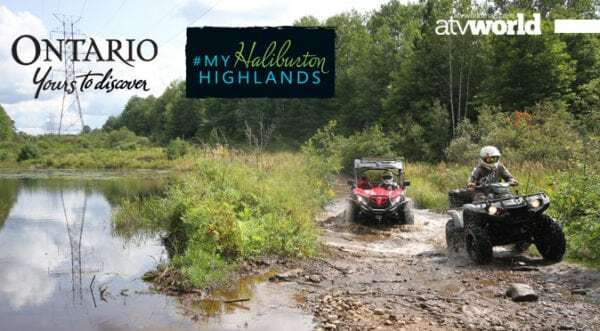 Regardless of the ATV/UTV and skillset you bring to region, there are trails here to match, and a plethora of local businesses that are ready to welcome you with open arms. 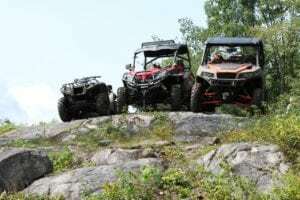 Travelers Note: You’ll need an HATVA trail permit to ride on the network of ATV trails in Haliburton Highlands. We picked up our permit from the South Wind Motel & Campground. 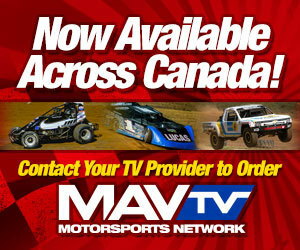 For the entire tour, all you will need is the Haliburton ATV Association Map Book. We picked up the latest version from the South Wind Motel & Campground.